Speed. AT&T's proposed acquisition of Time Warner (TWX) is premised on speed -- a need to keep up with consumer expectations and media industry changes. 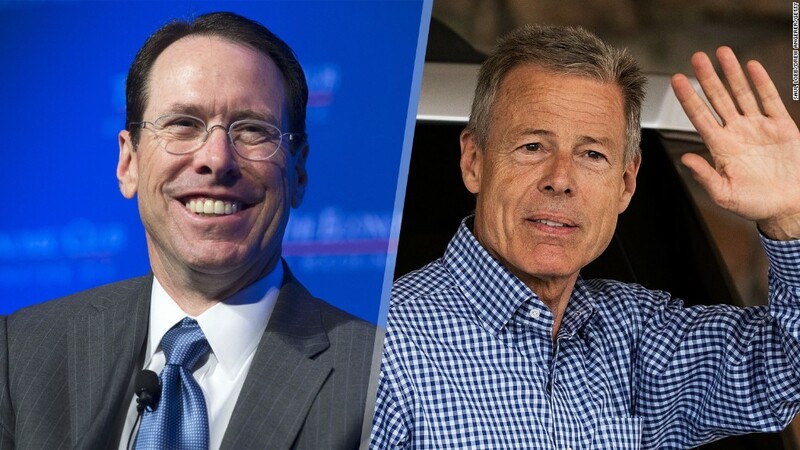 With the addition of Time Warner, "we can move much, much faster to bring our customers unique experiences in the world of mobility and the world of TV," AT&T (T) CEO Randall Stephenson says. Stephenson acknowledges, however, that the $85 billion deal will require a lengthy review by Washington regulators. The two companies are anticipating an approval by the end of 2017. For AT&T customers, nothing will change right away. Wireless service won't cost more or less as a direct result of the deal. But in the next few years, AT&T anticipates major changes in the ways we connect to and consume media, and it wants to be at the forefront of them. It wants to introduce new ways to watch TV and access news coverage. And it wants to persuade wireless customers to pay for a cable-like bundle of channels without the need for a cable cord. "Ultimately, we think we'll be competing head to head with the cable companies with a wireless offer," Stephenson said. "We can hit those kind of price points, combine it with this kind of content, we think this is exciting." AT&T is also looking to take on the cable companies in delivering broadband. And it is on this front that the company may be able to argue to regulators that it is going to deliver real benefits to consumers. Broadband in the U.S. is slow and expensive, especially compared to other countries, partly due to lack of competition. AT&T has big plans to bring innovative new wireless solutions to market. AT&T had already been charting this course before the talks with Time Warner turned into the deal that was announced on Saturday. It views Comcast (CMCSA), the country's biggest cable provider and the owner of NBCUniversal's channels, as a top competitor. Other distributor rivals include Charter and Dish, and other giants competing for ad dollars and attention spans include Facebook and Google. So the logic goes like this: Owning HBO, CNN, Warner Bros., and Time Warner's other assets will give AT&T a stronger hand in shaping the future of media. It could, for instance, use the control it will have over Time Warner to start building a new, more seamless, way to consume media. Time Warner CEO Jeff Bewkes has long promoted "TV Everywhere," an idea that people should be able to pay once for a bundle of TV channels and then watch anywhere, anytime, on any device. Imagine, for instance, that you're watching last night's episode of "Veep" on your TV as you get ready for work. You need to walk downstairs to make coffee, but you don't want to stop watching, so you get your iPad, hit a button, and it picks up exactly where you were. Then, when you're ready to leave the house, the show moves right to your phone -- or to the screen in your self-driving car. Cable companies would love to do this with shows from every network. But the adoption of this idea has been stymied by disagreements between channel owners like Time Warner and distributors like Comcast. If the channel owner is itself owned by the distributor, it will have a very difficult -- if not impossible -- time saying no. The deal could also eventually make AT&T's wireless, broadband and cable offerings more attractive to consumers. Stephenson has been talking about "unique" experiences for AT&T customers -- social media integrations, "curated content," and other things to be invented later. But it could, for instance, make new episodes of "Game of Thrones" available a week early for its customers. It could use Time Warner's assets -- its people, its studios, and the rights it owns to major franchises like Batman -- to produce entirely new shows or movies offered exclusively through AT&T. On Monday Stephenson and Bewkes began in earnest to sell the deal to regulators, Congress and consumers. In a joint interview on CNN's "New Day," Bewkes said the deal is a positive for consumers. "What it allows us to do is just move faster, with more innovation, better consumer offerings," Bewkes told CNN's Christine Romans. Time Warner programming will be "an anchor tenant for these kinds of experiences," Stephenson said in a telephone interview on Sunday. He predicted that "it's going to cause other content creators to join in... It's going to spur a whole cycle of innovation." A lot of what's being described is theoretical at the moment. But one example involves DirecTV Now, a streaming service that AT&T is planning to launch later this month. DirecTV Now is a cable-like bundle of channels that will be sold via the Internet. "Our challenge is to make sure our customers have choice," Stephenson said. He said he is convinced that a "large segment of our customers" will continue to pay for a "premium bundle," the kind most American households currently have, but "there is another segment of our customer base that wants mobility-centric content. They want smaller bundles of premium content. They want to integrate it with social apps." Buying Time Warner gives AT&T more influence over how bundling will evolve in the years to come. AT&T is clearly positioning itself as a nationwide wireless competitor to Comcast, and Stephenson asserted that "as this demand for premium content on these mobile devices continues to grow, it gives us more and more incentive to invest more and more in infrastructure." The executives are also predicting changes on the advertising front. The sharing of data between AT&T and Time Warner can result in "more effective advertising," Bewkes said on CNN's "New Day," and "therefore people are going to see that more of the cost of content can be borne by advertising, and the experience of television can be better." Stephenson said that because AT&T does not own big entertainment or news channels currently, the proposed deal is a "true vertical integration." AT&T's failed bid for T-Mobile, on the other hand, was a "horizontal integration" because it would have merged two competitors. "This transaction is not horizontal. We don't compete," Stephenson said. He added: "There's not a competitor being taken out. And, in fact, you're hard-pressed to find, in either one of our industries, a time when a vertical integration was shot down by regulators." When regulators reviewed the Comcast-NBCUniversal deal in 2010, they decided to approve it with a number of conditions attached. The merger took effect in 2011.